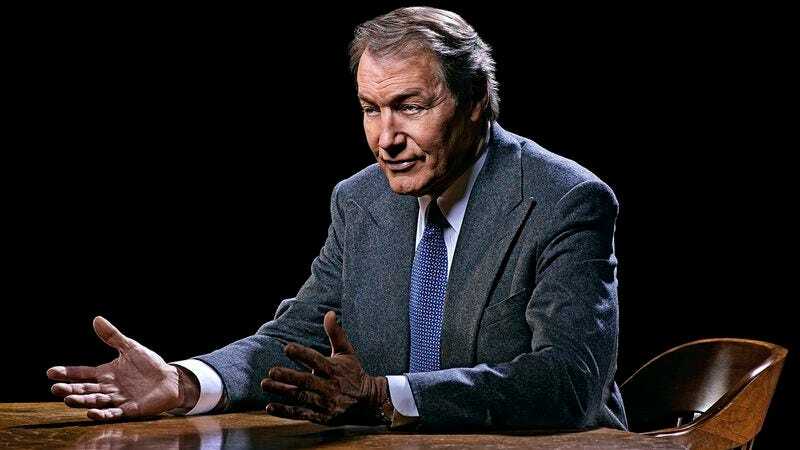 Charlie Rose is one of the most notable interviewers in American journalism, having conducted lengthy conversations with practically every worthy scientist, artist, politician, and activist in his more than 20 years on PBS. He’s also made small appearances as himself in films like Primary Colors and The Ides Of March, and a 2000 episode of The Simpsons. And according to a small, potential spoiler he let slip at a celebration of the new Breaking Bad exhibit at the Museum Of The Moving Image, he'll be expanding that filmography with an appearance on the show. While moderating a discussion with Vince Gilligan last night, Rose mentioned he will appear in the series’ penultimate episode—titled “Granite State,” a possible callback to the flash-forward in last year’s “Live Free Or Die”—a revelation which prompted Gillian to shout, “Spoiler alert!” Rose quickly quipped, “The check is still in the mail, right?” and no other details were mentioned, leaving us all to speculate wildly how these pictures could possibly lead to Charlie Rose showing up in the world of Breaking Bad in a few short months.